Alexa Wilson is an artist from New Zealand based in Berlin for 3 years and has presented 25 performance and video works in NZ, Europe, Australia and NYC. She performed “Star/Oracle of Delphi” at Leonhardhi Kulturprojeckt Frankfurt 2012, CPR NYC, Ada Studio, Reh Kunst Gallery/Brooklyn's This Red Door and G30 Gallery Berlin 2013, 100 Grad Berlin Festival at Sophiensaele in2013, Volksroom Brussels, Poznan Design Festival Poland, Art Space Gallery Auckland and will present in Tempo Dance Festival and Body Festival/Physics Room NZ 2014. She is doing a Red Gate Residency in Beijing 2014 to complete the video version of "Extraordinary Aliens". She is creating a new work “The Status of Being" on Footnote Dance Company to tour NZ 2014 and Europe/America 2015 and is about to publish her first book "Theatre of Ocean". 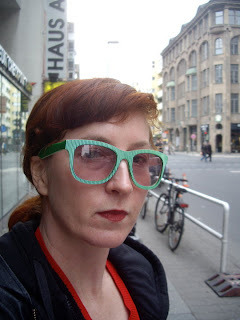 She presented "Extraordinary Aliens" at AUSUFERN Berlin festival and Month of Performance Art Berlin 2013. She performed in Hamburg for “Aktionen/ Attraktionen” 2013 with Geheimagentur/Random House a collaboration with Mark Harvey. "Berlin Bedroom Dance" was selected toscreen on an ABC/Disney TV Series in America 2013. She worked with performance/video artist Linda Montano in NYC in 2012, also doing a PG Dip Fine Art with Transart in Berlin/NYC. She has accolades in NZ including “Weg: A-Way” (4 Auckland Fringe Awards including Auckland Arts Festival Award) 2011, “Toxic White Elephant Shock” (CreativeNZ/Tup Lang Award) 09, "Magic Box" (Best Emerging NZ choreographer/NZ Listener) 04. She collaborated on a satire “Show Pony” with actress Nisha Madhan for the New Performance Festival, curated by Stephen Bain at the Aotea Centre in 2012. She received a Goethe Institute Scholarship to study in Berlin and a Turbo residency with Anna Macrae at Impulstanz Vienna 2009. She has danced for top NZ choreographers (Douglas Wright, Lisa Densem, Malia Johnston, Anna Bate) and created works on Touch Compass Mixed Ability Dance Co, Rifleman Productions and Unitec School of Performing and Screen Arts students as a guest choreographer in NZ. She has a BA in Women's Studies and Film Studies, MA in Film Production from The University of Auckland, majoring in Screenwriting and a BPSA in Dance from Unitec SPASA. She has taught at top NZ institutions in Film Theory and Interdisciplinary Performance (Auckland University, Unitec, MIT).